The last time ZFS was covered, an description of overall features were covered. How to use all of those features was uncovered. This post will try to cover some of the other features. ZFS centralizes all directory sharing into a single command structure and removes the needs to manage arcane configuration files to deal with issue such as configuration, status, and persistency. The new ZFS suite offers protocol sharing of iSCSI, NFS as well as SMB(CIFS). There is a catch to this: the ZFS host must support a kernel implementations of the protocols - SMB(CIFS) is only supported under more recent releases of OpenSolaris and iSCSI is only supported under the Solaris families. ZFS uses a property to determine whether a filesystem mount is going to be shared or not. To stop NFS sharing of a ZFS filesystem. To start an NFS sharing of a ZFS filesystem. - /u000 anon=60001,rw=servera "" - /u201 rw ""
On a foreign server, one can check to see what is being shared (via NFS protocol), persistent or not. A listing of foreign protocols that can be checked are in a configuration file on the remote host. For the share and dfshares command, if no protocol is specified, then the "nfs" protocol is the default. A ZFS filesystem shared over NFS can be done using the "share" and "dfshares" command. In most historic POSIX systems, there is a file referred to as "sharetab" (or some derivative of it) to review the sharing of filesystems. This is effective against any underlying filesystem (i.e. UFS, VxFS, ZFS, etc.) In the example below, cdunix is not on a ZFS filesystem. If one is running a pure ZFS environment, persistence is held as a property. You can see the status of the ZFS file share through a ZFS command. Checking all shared protocols through ZFS is also possible, through parsing "all" properties option. Checking the share status for all protocols from a foreign server is not as elegant. Individual protocols must be used, such as the "dfshares" command. A New Tablet on the Horizon? There has been grumbling about Apple Macintosh "tablet" form factors for years, although the leaks have been getting more substantial as of late. "The iTouch Tablet is about to change society as we know it." This comment really all depends upon the execution by Apple. What made the iPod, iPod Touch and iPhone successful? Apple figured out how to change the industries in three markets: portable music players, PDA's, and Cell Phones. As a side note, Apple failed to create the PDA market with the Newton. If Apple applies the same consideration into the Tablet market, they could do well. Anyone who has used cheaply manufactured devices (made with little attention to software & hardware details) tire of the experience quickly (due to the issues inherent with trash design & manufacturing.) A large number of good ideas go to the technical graveyard when consumers believe they are poorly implemented the first time around. An Apple "iTablet" with the engineering of a Apple MacBook Air might be accepted rapidly. Anyone who has used industrial devices, which have physical controls, spend a pretty penny for them - moving the technology to touch screen controls could result in a far better user experience and longevity in the device usage without substantial maintenance in cleaning sliders/pots. If Apple does a tablet right, they could really revolutionize many industries. What does all of this have to do with Network Management? Network Management uses obtuse interfaces from a variety of vendors. The features from multiple vendors use significantly different interfaces, some of which provide poor user interface capabilities, and all are generally very expensive to implement on a per-user basis. People are becoming familiar with many "Web 2.0" features in every day life and these are not being backfilled into the Network Management arena by vendors. People are demanding more mobility and many Network Management vendors are not delivering these features by investing in a time of low revenue in an global economic recession. How could these issues be resolved in a tablet? Corporations are already leveraging portables such as iPod Touch and iPhone via Microsoft Exchange support for corporate applications. VPN capabilities are built into remote devices like the iPhone today for remote capabilities. Using a standard interface, imposed by the iPod Touch or iPhone API's for multiple existing Web 2.0 applications, help users reduce barriers to entry through simplification, and would reduce training requirements for existing Network Management applications due to obtuse user interfaces by the vendors. Using a standard interface, imposed by the iPod Touch or iPhone API's for multiple existing Web 2.0 applications, would allow greater cross-vendor integration, since the platform would become the integration location. User interaction with Network Management maps and displays often use mouse clicks and drags, while API's in the iPod Touch and iPhone offer much more intuitive interactions such as dragging your finger or pinch. API integration of Google Maps into iPod Touch or iPhone with Location would reduce the burden of development on Network Management user interfaces - providing sophisticated geographical maps to the application provider without needing to create & license bloat-ware. The cost of a Apple "iTablet" hardware (or whatever it will be called) would be far less than the licensing per-user that is typically paid to a vendor on a per-seat charge, if standard interfaces could be developed to Web 2.0 environment. Not knowing what managed vendor equipment looks like is something that could be a thing of the past when leveraging software suite built into the Apple iPhone or iPod Touch - with the ability to have integrated photo library that sync's with a central database, a library could be kept up-to-date on all remote devices very easily, since the software management is built in. Will Apple release a tablet? This is a great unknown, but all being said, moving Network Management applications to devices like the Apple iPod Touch and iPhone is a no-brainer. A larger form factor in an appliance (that is not an Apple laptop) could easily infiltrate the Network Management business, especially if it can demonstrate cost savings during dire economic times. There has been much speculation concerning the rumor originating from the New York Times suggesting Sun Microsystems canceled the processor UltraSPARC RK called 'Rock'. Understanding the history behind 'Rock' provides support to just about any rumor. "Even if Rock had made it to market, it would have been an uninteresting processor as companies like Intel and AMD are offering high-performance chips at more reasonable prices, said Dean McCarron, principal analyst at Mercury Research." Suggesting 'Rock' is "uninteresting" demonstrates a level of ignorance beyond comprehension. 'Rock' is a very interesting processor in the academic world since companies like Intel and AMD have not recently pioneered computer science technologies in silicon to optimize single threaded applications. Implementations of theory in real silicon are very important to review academic thoughts and determine future implications. Implementations like 'Rock' are studied for decades. 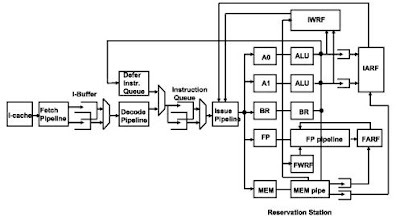 'Rock' is a very interesting processor for business, military, and academia system performance of single thread bound applications - software threads on 'Rock' runs with very few of the painfully long waits on slow memory due to cache misses, commonly experienced with Intel and AMD processors. People who purchase systems expect their systems to be doing work, instead of sitting around idle. 'Rock' is a very interesting processor in the commercial world since accelerating legacy single thread-bound software allow for acceleration of existing software (which does not scale well with multiple threads) - something the major CPU developers (AMD and Intel) in rest of the market have been ignoring for a couple of years. If a single thread is the problem, newer CPU's from other vendors will not solve their performance problem, increase the thread bottlenecked performance, and increase the business profitability. 'Rock' is a very interesting processor in the investment community. 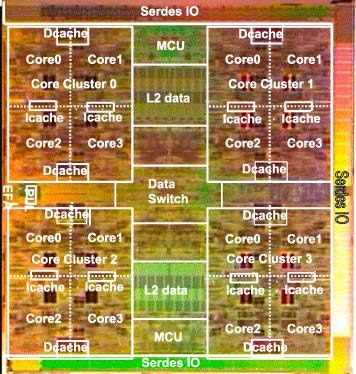 Sun had pioneered the niche of multi-threaded hardware with the release of their 32 hardware thread UltraSPARC T1 processor - driving other vendors (Intel, AMD) to change their directions to start heavily threading their CPU's... discontinuing projects to speed existing single-threaded applications. The release of Rock would enable Sun to pioneer this lost niche, abandoned by the other vendors. Filling niches are very profitable to investors in those technologies. 'Rock' is very interesting to the environmentally conscience consumer. Very little work has been done recently in the market to increase the performance of single threaded software, with the exception of increasing clock rate, which drives up the costs to consumers in: hardware, cooling, and power consumption. Rock has been the exception - targeting increased single threaded performance without aggressively increasing clock rate and the negatives that go along with it. 'Rock' is a very interesting processor for enterprises struggling with consolidation efforts. Bundling 16 high-speed cores into a single chip which supports LDOM's at the firmware level and Solaris Containers at the OS Level provides a consolidation platform for legacy applications which are not highly-threaded and required high single threaded throughput. Network Management infrastructure is greatly benefited by highly threaded underlying infrastructure. It is not unusual to tun run hundreds to thousands of polling threads on centralized network management platforms. Any highly-threaded CPU platform (Sun OpenSPARC UltraSPARC T series) help to provide hardware acceleration to the polling processes, reducing the amount of time proprietary CPU's normally spend on context switches, constantly pulling/pushing registers from/to slow memory. While Network Management sees great performance strides with highly threaded hardware during 24x7x365 operations, not all areas are optimized. Two areas where highly threaded hardware (with slower individual thread performance) need improvement include: startup/shutdown time when the database needs to be loaded/dumped and post-discovery time when data needs to be consolidated with relationships built to all the other objects. On some very large network topologies with extremely high (99.999) availability concerns - a slow startup time or slow post-discovery time is considered unacceptable - every minute counts in the case of software or hardware failure when protected with a High Availability kit. 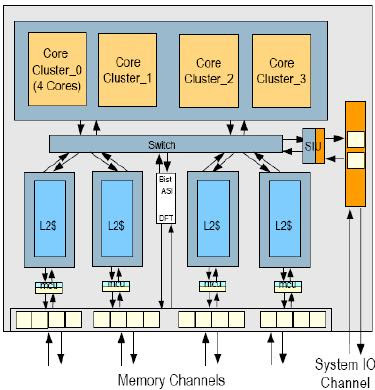 Rock provides a mid-range position, between the $100K US$ super-threaded UltraSPARC T2+ SMP processors with high throughput (256 hardware threads) leveraging slower threads, and super-fast $1M US$ super-core'ed SPARC64 VII SMP (256 hardware threads) leveraging faster threads. Rock's role in network management is clearly defined and beneficial. In the end, I can't say that I'm really sold on Sun's very aggressive use of speculative execution, but I will say that Rock is one of the most interesting and novel processors that I've seen in 10 years of covering this space. In its own way, it's every bit as exotic as IBM's Cell processor, but because all of that exoticism is hidden from the programmer it won't be nearly as difficult for developers to deal with.